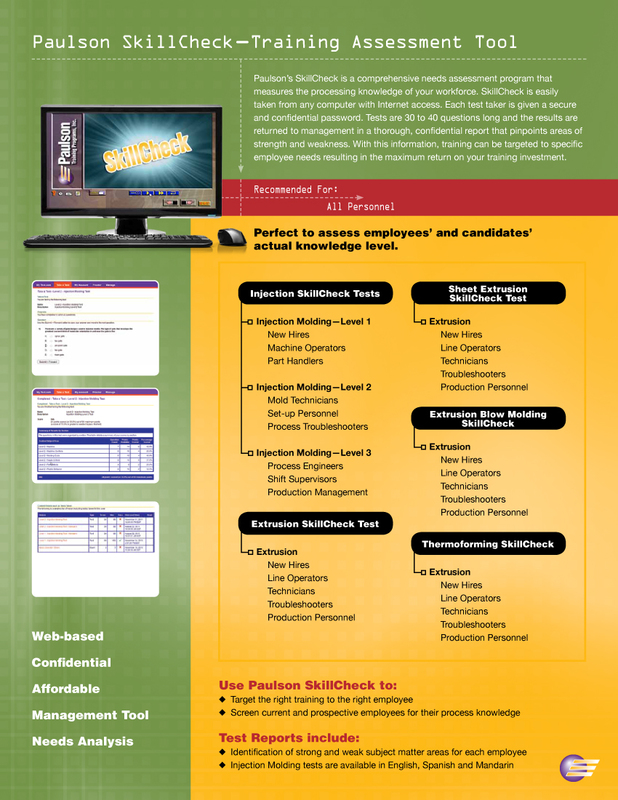 Based on decades of experience in testing and evaluating of employees, Paulson Training has designed SkillCheck, an assessment tool to measure the knowledge and skills of 3 levels of injection molding personnel: operators, technicians and molding engineers and experts. We also have a SkillCheck test for extrusion personnel applicable to all levels of production. Note: Different plants may use different job titles. Use the Goals of each assessment described below to determine the right level of SkillCheck for your employees. Measure the overall injection molding knowledge of each person tested. Determine the areas of strength and weakness for each person so that specific training can be recommended. Measure the overall plant-wide skill level compared to other molding plants and develop a blueprint for improvement. There are 45 questions for the operator (machine attendant) and parts/material handlers. This assessment measures basic knowledge of injection molding machine safety, proper procedures, the injection machine cycle, and mold and molding machine components. Goal of Basic Operator Assessment: The emphasis in this test is on personal work procedures, safety, part problem identification, mold and machine components. A score of 75% or higher would indicate a knowledgeable and competent employee. There are 42 questions on machine setup, machine operation, problem solving, and the effects of the machine controls. Typical job title is foreman, setup technician, lead person. Goal of Technician Assessment: At the technician level, the person is expected to be able to setup the controls on the molding machine, establish an optimized cycle and solve most molding problems. To do this, the person must understand the injection molding cycle and the effects that each machine control has on the plastics. A score of 80% or higher indicates a very competent technician. For the expert level there are 46 questions on molded part structure, causes of molded part defects and the effects of the machine controls on the plastic and the finished part properties. Typical job titles are senior technicians, process experts and process engineers. Goal of Expert Assessment: The questions in this test require an understanding of plastic behavior and the inter-relationship between the machine controls and the four basic plastic processing variables. The molding expert is able to determine the plastic causes of part problems and then know the best method to reach a solution. This level of understanding can rarely be achieved through experience alone, it also must be achieved through technical understanding of the molding process. A true “molding expert” will achieve a score of 85% or higher and be competent to tackle any molding problem. These tests are designed to measure individual knowledge levels. However, if the results for all the personnel in your plant are average management can get an idea of their comparative position in the industry. You’re in good shape compared to your competition. Your plant ranking would be in the 90 to 95 percentile range for all molding plants. One vulnerability is if key personnel leave, you need to be confident that you have competent replacements ready to step in. Consider a training system that keeps all employees operating at a high efficiency level. If you have 10% or fewer of your production employees who stand out with technician and experts scores above 85% and then a gap with others mostly in the low 60% and below, you have a replacement problem. The plant is probably running fairly well. However, the gap means you are not training new key personnel to replace to your existing experts. You are probably working your best people too hard since they are the ones always on call. You should develop a plan to increase knowledge and skills of the 60% and below employees to avoid disruption if one or more key employees leave. This is an average to below average range. These results would indicate a low level of process capability. Typical results of this capability are long cycle times, late shipments, high reject rates, excessive employee turnover and unscheduled machine shutdowns. The employees do not have the skill level necessary to operate efficiently. You should look at a complete implementation of a training system that “grows your own” expertise in-house. You need an on-going training process, not a series of training “events”.